Peace and quiet beckons in this spacious 1st floor, 3 bedrooms, 3 bathrooms unit in Evian. 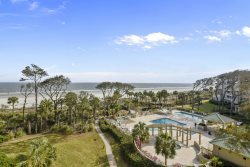 Located only 1.1 miles away from the beach, the unit offers an easy 15-20 minute walk to the beach or a 5-7 minute bike ride making it the ideal location if you want a Hilton Head vacation without the Hilton Head price tag! Step into the warm entry foyer and be led pass the powder room and into the very functional, galley- style kitchen. Its stainless steel appliances will make creating gourmet meals and quick picnic lunches fun and more delightful. Just off the kitchen is the bright breakfast nook with seating for four and landscape views; sit here and get lost in a novel while sipping your coffee or spend time bonding over a game of cards. 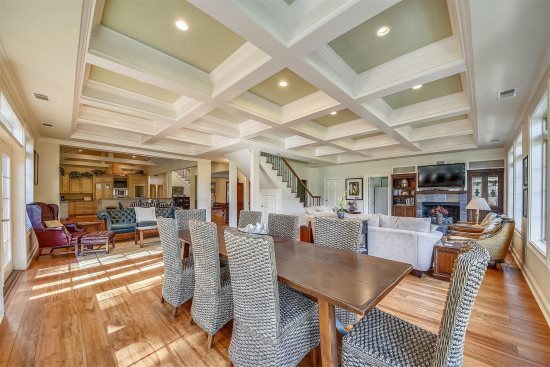 The very chic dining room has a sleek glass top table and six comfy dining room chairs. The wet bar just across from the dining room features a sink for washing your garnishes and granite countertops so that you will have plenteous space to create your favorite cocktails; add wine to the mounted wine rack and you are ready to entertain friends and family. Decked out in light earthy tones with a pop of color is the bright and calming living room; home to plush couches, armchairs, and ottomans, a decorative fireplace, and a mounted flat screen television. Lush landscape views are visible from this room. Also on the first floor is one of three bedrooms. Decorated professionally in greys and teals, this bedroom has a queen-size bed, fun mounted artwork, and a snug armchair for you to sit and flip through a magazine when you are all done binge watching all the episodes that you missed of your favorite TV shows. This bedroom also has its own bathroom with a shower. Up the stairs you will find the master bedroom with plenty of room to relax. 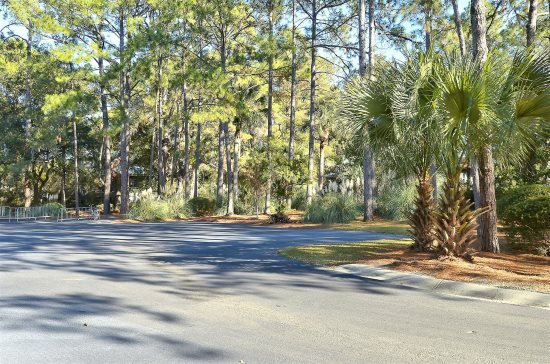 It has a king-size bed, a lounge chair, a flat screen television, and a full master bathroom with a walk-in shower. The guest bedroom has two twin- size beds, a television, and a night table with a chair. This bedroom also has its own bathroom which offers a shower/tub combo. Take full advantage of the tropical Evian pool or tennis courts, or just relax on this end unit's private deck while listening to the sounds of the island birds and the wind whispering through the palm trees.